Choose the most suitable leg bag for YOUR lifestyle! because they are about 2cm wider to get the same capacity into a short length bag. Good news if you are not 6 foot tall! Specifically designed to be worn under short clothing so you wear what you want not dress to cover your leg bag! Specifically designed for wheelchair users. 18 versions available on UK prescription - 700ml and 1300ml capacities with a variety of inlet tube lengths and outlet taps. No more worries about finding accessible toilets! Childrens Bags - shape and proportions suitable for children from 4 years of age to adolescents and people of smaller stature. At last a drainage bag of appropriate proportions for smaller people with a realistic capacity. New discreet twist to open tap. 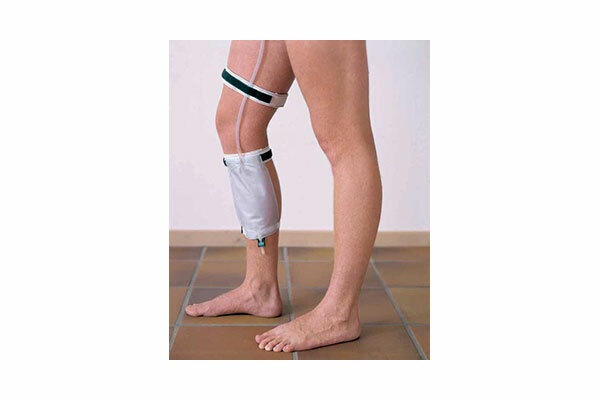 Wide 38mm strap to secure the top of the drainage bag firmly to your leg. The bag is actually strapped to the wide strap by the 20mm wide dark green velcro strap sewn onto the middle of the wide white elastic strap. Both have silicone lines to prevent slippage.